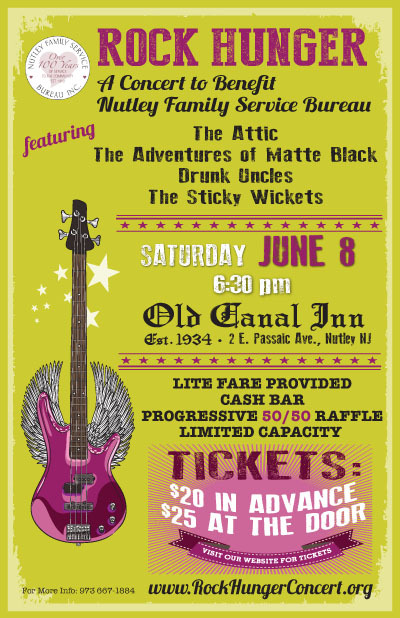 Nutley Family Service Bureau had a-rockin’ repeat of two years ago successful live show at The Old Canal Inn, 2 East Passaic Ave, Nutley. This year’s event will take place on Friday, June 8th, 2019. The concert headlined band The Attic will be joined by special guests The Adventures of Matte Black, Drunk Uncles and The Sticky Wickets. Light-fare food, great tunes, and chances to win wonderful door prizes were enjoyed by all! Proceeds benefits NFSB programs and services, including the NFSB Food Pantry. Our thanks to all who make the evening a success. Pre-event ticket pricing is $20/ticket and $25/ticket at the door.